Permanently repairs holes, gouges, cuts, rivet leaks in aluminum boats and RVs. Seals leaks in fuel water tanks and lines, pipe joints, drains, exhaust lines, manifolds and mufflers. 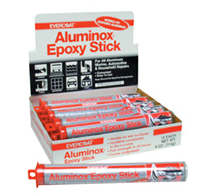 Cuts through oxidation and anoxidation to enhance ability to adhere to old aluminum. Works equally well on other materials including fiuberlgass, wood, other metals and ceramics. Sets in 30 minutes. Can be sanded, painted, drilled, tapped and filed. Will not shrink or pull away.